Airplanes connect small Karlovy Vary international airport (airport code: KLV) (reachable by bus #8 a few times a day) mostly with Moscow Sheremetyevo (SVO) by Czech Airlines and with Moscow Vnukovo (VKO) by Russian low-cost airline Pobeda. There are a few irregular domestic flights from Prague by Czech Airlines (flight time 30 min with an Airbus A319), these are however ferry flights for the Karlovy Vary-Moscow/St. Petersburg route. Buses by Student Agency connect the town (Tržnice bus station between Becherovka museum and Albert supermarket, and nearby Terminál bus station which is next to Karlovy Vary dolní nádraží railway station) with Prague on an hourly basis. A one-way trip costs EUR 6 and takes around 2 hours. The same bus company connects the Czech border town of Cheb with Karlovy Vary. One-way trip starts from EUR 1.70 and takes around 50 minutes. Flixbus also offers cheap rides from Prague Florenc Station to both Karlovy Vary Terminál bus station and Tržnice bus station starting from EUR 5 one-way. Connecting trips via Marktredwitz from Southern Bavaria are possible. Trains by Czech Railways (České dráhy) connect Karlovy Vary (lower station - Karlovy Vary dolní nádraží) with nearby towns and resorts like Mariánské Lázně. The German Railways' "Bayern-Böhmen-Ticket" (Bavaria-Bohemia-Ticket) for 26 Euro for the 1st person and additional 5.60 Euro for every further traveller in the group (max. 5 people however) can also arrange you a cheap journey to the Czech spa town: From Munich you can reach Karlovy Vary with a few transfers (at Regensburg/Nuremberg, Marktredwitz and Cheb (CZ)). By car it takes around 4 hours from Munich. A toll fee applies on Czech highways. The road tax sticker ('známka' in Czech) can be bought at gas stations or shops near the border. The cheapest, a 10-day sticker, costs CZK 310 (EUR 11.50). Driving without a sticker on Czech highways may result in high penalties. Small portions of certain highways don't need such stickers, see this map for more info. From either the Karlovy Vary dolní nádraží Railway Station or Tržnice bus station we head to the beginning of the T.G. Masaryka street. There you'll find Jan Becher Museum dedicated to famous Czech 38% herbal-alcoholic drink, the Becherovka and its creator, Josef Vitus Becher, a pharmacist from Karlovy Vary. The museum has interesting tours in Czech (with audio guides) and in English. 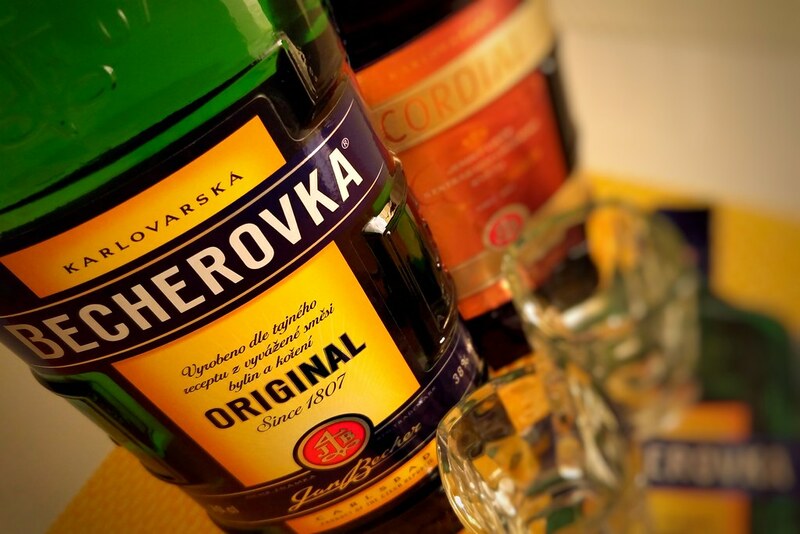 They both end with some Beherovka brands degustation! Along T. G. Masaryka we pass the info center where we can get a map of the city for better navigation. This beautiful Neo-Baroque building is actually a public spa bath house where you can get tons of wellness packages: a bubbly hydro massage, salt treatments, a beauty spa, a nice body massage or just have a swim in the public swimming pool. The bath was named after Elisabeth (Sissi), wife of Austrian Emperor Franz Joseph I. Credit cards are accepted in hotels and restaurants, some hotels and restaurants also accept Euros. It is however useful to exchange some money if you need to grab something to eat on the go, buy souvenirs, etc. After crossing the bridge over the Tepla River we are in front of one of the most iconic (though not that charming) hotels in Karlovy Vary. Hotel Thermal. It was built in Soviet times, nowadays it hosts the annual Karlovy Vary Film Festival featuring known faces like Susan Sarandon or Danny De Vito. The hotel has its own outdoor mineral-water swimming pool: Swimming in a 32°C hot water while outside its freezing temperatures is... literally cool. The pool is also open to public, it is accessible via an in-house funicular (or through a walking path around the hotel). As of October 2016 the public pool is unfortunately closed. Hotel Thermal. 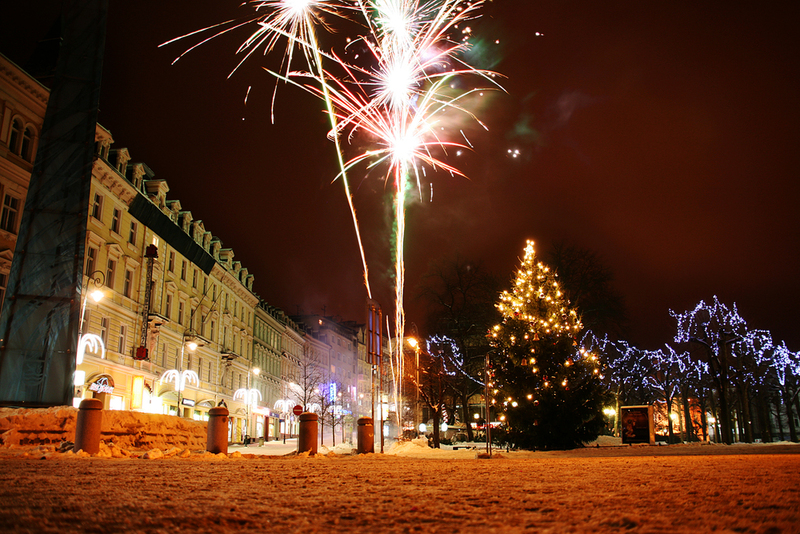 It hosts the annual Karlovy Vary Film Festival. This garden with the adjacent colonade is named after famous Czech music composer Antonín Dvořák, a frequent guest of the spa town. When in Karlovy Vary one cannot just walk by this colonade without having a sip of some hot mineral water from one of the thirteen springs here. The taste is horrible but the water is healthy. They say. Karlovy Vary. Mlynska Kolonada. There are five springs at this colonnade: Mill Spring, Rock Spring, Libuše Spring, Nymph Spring and Prince Václav I Spring. Karlovy Vary. Mlynska Kolonada at night. The colonnade features 124 Corinthian columns. Mlynska Kolonada. View to the south-east. The square over Tepla river in front of the colonnade didn't exist till 1949. While in Bohemia you must try their specialities. Most menue items are rather heavy and not quite suitable for vegetarians. One of the most famous dishes is Svíčková na smetaně: Beef meat served with cream sauce. Additionally a pair of knedlí (bread dumplings) is offered. As a desert I recommend Lazenske Oplatky. That's a typical waffle sort filled with cinnamon and plum mousse from Karlovy Vary. Bon appétit! Dobrou chuť! Tipping is not an obligation but a nice gesture especially if you're satisfied with the food and the service. A tip of 6%-10% is alright. From the colonnade take the "Zámecký Vrch" leading up to Hotel Bristol Palace. While admiring the architecture you might ask yourself where is M. Gustave H., welcoming elderly women to the Grand Budapest Hotel,... err... Bristol Palace. Opposite the hotel you might spot a tiny Baroque chapel: Chapel of Saint Anne. The spa town has a variety of lovely hotels scattered along or above the Teplá river. Many of them offer low-priced 3-, 4-, 7-day wellness (family) packages including breakfast and dinner, massages, baths and selected spa procedures. Parking in downtown may be limited, some hotels however have own parking lots (some are guarded 24/7) or provide free entry to public lots for their guests. Deals can be found either on the hotels' websites or on spa portals like Topkur or Karlovy Vary Tourism. My insider tip is Hotel "Prezident": They have a unique sauna landscape (steam sauna, Finnish sauna, tepidarium, aromatic bio-sauna... I can still smell the lemon grass...) and private spa suites! Make sure that your booking provides a free entry to their spa, several saunas and swimming pool and, if possible, free parking (if you arrive by car). The building houses a majestic geysir shooting up hot mineral water up to around 15 meters high. Totally worth a visit, especially on a cold day. Karlovy Vary. View over Tepla river. 9. Catholic church "Maria Magdalena"
This cathedral in the heart of Karlovy Vary was built between 1733-1736. Opening hours are rather sparse, it's still worth a try getting inside. 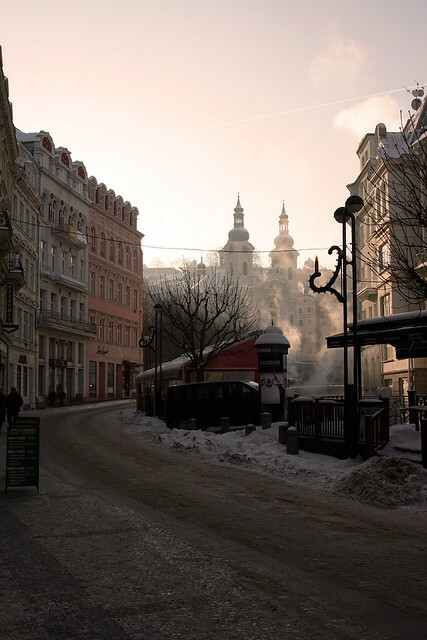 Early morning in Karlovy Vary. Maria Magdalena church in the far. Our river walk leads us to Grandhotel Pupp around the corner. This splurge hotel is not only a fancy place to relax and get awesome wellness procedures. It used to be the shooting location of movies like Shanghai Knights, Last Holiday and James Bond: Casino Royale. Grandhotep Pupp. Used in film productions like "Casino Royale". The Czech spa town was frequented by many "celebrities" in the past. Among others Kemal Atatürk (the founder of the Turkish Republic and also Turkey's first president), Fryderyk Chopin (a famous composer from Poland), Beethoven, Goethe, Turgenev... Nowadays some Russian oligarchs and VIPs have bought properties here, like singer Alla Pugacheva. 11. Emperor Bath / Casino from "Casino Royale"
Diagonally from Grandhotel Pupp the old Emperor Bath can be seen. It used to be a filming location of "Casino Royale" where it was used as a casino in Montenegro. In the movie James Bond (played by Daniel Craig) is nearly having a cardiac arrest as he just rushes to his sports car. The view from Diana Tower (just over Grandhotel Pupp) to Karlovy Vary is superb. 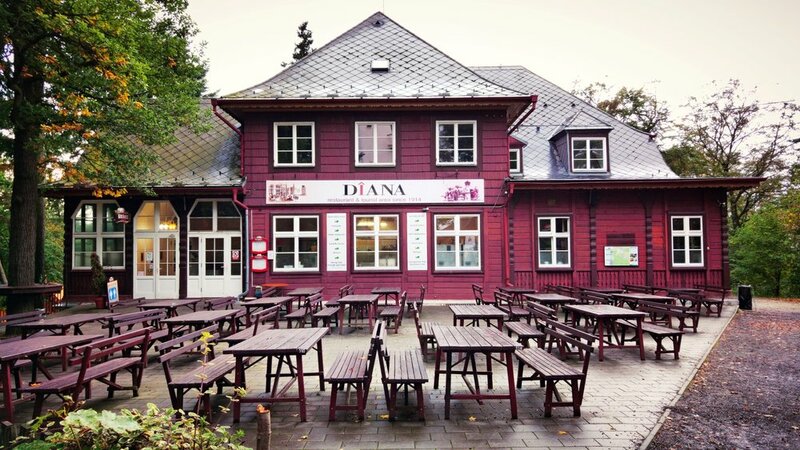 The tower, the Diana restaurant and the mini-zoo with a butterfly house nearby are accessible via a funicular that runs every 15 minutes (daily, from 9 am to around 5 pm, schedule varies). The lower station is next to Grandhotel Pupp. One ride is CZK 45 (EUR 1.67), a return ticket is CZK 80 (EUR 3). The access to the observation tower is free! The intermediate funicular station gives an easy access to the Deep Jump Lookout (Jelení skok) through a path. The whole area includes a dense network of walking paths with different difficulty levels. The funicular train at the lower station. The station is in a narrow pedestrian street just before Grandhotel Pupp. The view from Diana lookout tower. Both stairs and an elevator are going to the top. Just behind the restaurant you will find a tiny petting zoo and a butterfly house. Karlovy Vary. Fireworks in downtown.